As the first day of #AcumaticaSummit 2019 highlighted, the Acumatica team plans to continue their run as one of best cloud ERP software products on the market. 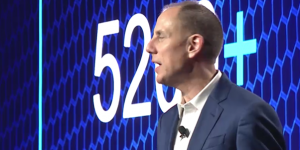 More than 1,500 Acumatica partners, customers, media and analysts visited the Acumatica Summit 2019 in Marriott Marquis Houston to share the excitement of main achievements of 2018 as well as to reveal plans for 2019. Eleven years of hard work has continued to pay off in 2018. 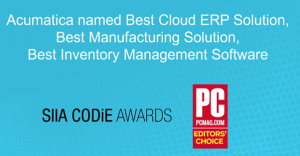 Acumatica’s cloud ERP software was internationally recognised with six awards for the best cloud ERP solution and best Manufacturing Solution in 2018 – SIIA CODiE Award, it also earned the Best Inventory Management Software of 2018 from PC Mag Editor’s Choice, as well as others. 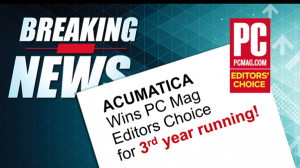 And for the third year in a row, Acumatica has achieved the PC Mag’s Editor’s Choice for Best ERP Solution. Acumatica also earned the highest customer satisfaction among all ERP vendors surveyed in Gartner’s latest Magic Quadrant, was on the top for user satisfaction in comparison to other three vendors and achieved top position in G2 Crowd’s report, as well as got highest rankings out of 22 ERP vendors for usability in Nucleus Research ERP Technology Value Matrix. Digital transformation is impossible without a customer-centric approach. Jon emphasised how Acumatica’s true cloud ERP has influenced the way top companies managed to increase revenue and enhance business management processes. The key focus of a digital transformation strategy of any company has to be on business management software. A “Product to Project” company MiiR, producer of stainless steel drinkware, was featured in a video case study as a top Acumatica customer and highlighted how Acumatica helps to improve all business processes, become more connected, and increase income. They have chosen Acumatica for being “simple, scalable and robust solution with clean and powerful APIs”, which helped them to make better decisions in their business. Bill Schaffler, the CEO of Nothing Bundt Cakes, shared with the audience how Acumatica helped to connect their 300 bakeries (growing every week, adding new franchisees) all over the country, as well as making it simple and easy for all team members to communicate and have access to same data in real time. Bill also mentioned that Acumatica improved dramatically their inventory tracking and forecasting capability. One more Acumatica’s customer Fabuwood, a top USA kitchen manufacturer, was presented with the Acumatica Summit 2018 Customer of the Year Award. The company’s representatives mentioned that they have experienced significant growth since they implemented Acumatica cloud ERP into their 800 plus – employee company. John Roskill also announced a long-term cooperation agreement with top business management software provider from France -Cegid. Gayle Reitmulder, VP of Finance and CFO World of Hope of International, a nonprofit organisation, spoke to the audience about how World of Hope helps connect farmers to market. They use grants to help farmers and needed a cloud ERP software to remain compliant, as well as to connect team members globally. 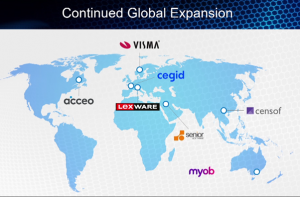 One of their main needs was the for multi-currency capability within the ERP software. Acumatica helped them to increase data processing accuracy and prevent fraudulent behavior inside their company. World of Hope International was announced the 2018 Acumatica Non-Profit of the Year award recipient. Following the latest release, Acumatica 2019 R1, Acumatica prepares for leading positions in 2019 with the help of innovative technologies and top-notch customer service. 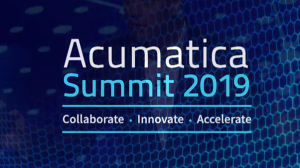 Attendees at Acumatica Summit 2019 were given a first look at the new product offering. Jessica Gadbois, Acumatica’s Partner Enablement Manager demonstrated the enhancements that were made to various features, including the generic inquiry side panel. The performance for this feature has been greatly enhanced with the panel loading instantly; the side panel can also now be minimised and maximised and an expand and collapse button. Jessica also demonstrated the ability to personalise an instance based on colors, which allows distinguishing colour themes between different companies or branches. She also touched on the addition of conditional highlighting in Generic Inquiries as a visual aid, as well as changes to pivot tables. Acumatica 2019 R1 has added a processing bar for system admins or users who run long processes, showing how many processes remain with visibility into customer records and a dashboard for system administrators that run long processes, showing how many processes remain visible in client records. In the end, Jessica announced an important new security feature with multi-factor authentication. Whether through text, SMS or push messages, users are confident that they and their information are safe. Jon also discussed the machine learning and artificial intelligence. He said, “This is the first time we are commercially shipping some of the AI/machine learning work that you’ve seen us talk about for the last two Summits.” John demonstrated how a natural language search allows Acumatica—behind the scenes—to see how long you spend on a page if you’ve found the information helpful or not, and then uses it for future searches. 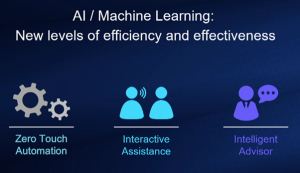 The goal is to get more valuable information in a more natural language format. Acumatica announced new features, which help to make dashboards easy to build and modify. Now you can get information out and use customisable dashboards in real-time. In Acumatica’s ISV community there is also a number of third-party applications available now. They improve the reporting and analysis dramatically. Velixo allows users to build detailed financial reports, using Acumatica data in excel spreadsheets. The Construction Edition was introduced in 2018 as the first version of cloud accounting for the construction industry. Since then, Acumantica has been building other integrations, to provide an end-to-end scenario for users with increased functionality. 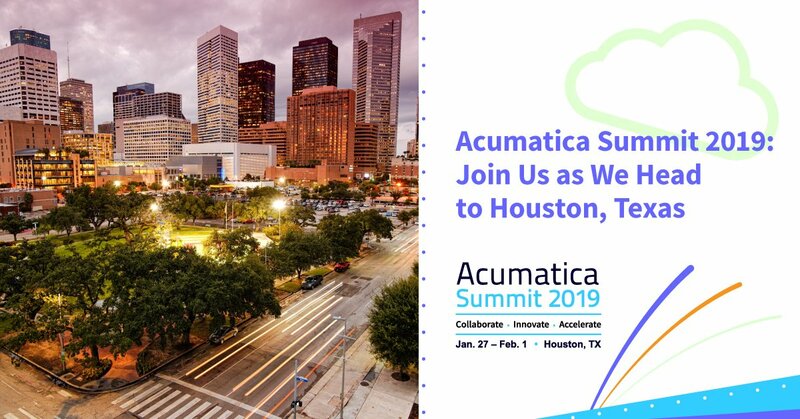 Stay tuned for more interesting insights from Acumatica Summit 2019!